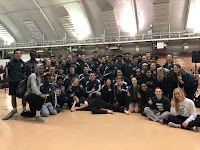 On Saturday the boys Track & Field team represented JMM in both the Class B and Class A events at the Madison West Relays. During the morning Class B section Madison Memorial was able to enter some younger athletes and JV competitors to compete against the varsity athletes from the small schools around the state. In the afternoon session our varsity boys competed against the large school athletes from Wisconsin and Illinois. Some great competition was had across all events as the boys looked to close out their indoor season on a high note. The boys took another step to improve at all levels and look forward to getting more athletes involved in the competition for varsity spots next week at our outdoor meets. Track & field is a sport that rewards hard work, dedication, and top performances. If you aren't where you want to be this indoor season keep up the hard work and show improvement as we head outdoors. During the morning session at West Relays the JMM boys were led by Jeremy G in the shot put who recorded a PR throw of 44' 11.25" to place 5th in the event and score our only points in the morning session. Despite not scoring points in the other events our JV athletes had many great performances led by PRs for freshman Lonnie T running 6.90 in the 55m dash, sophomore Alex A with a 56.62 in the 400m dash, junior Calder B running 2:20.70 in the 800m dash, freshman Casey GT improving his 3200m time to 11:18.30, sophomore Jezell T leaping 19' 1.5" in the long jump, and junior Drake S improving to 17' 2" in the long jump. With continued improvement I see many of these athletes making contributions not only this outdoor season but into the future too. The afternoon session was highlighted by the performance of Daurice F in the 55m hurdles and long jump. Daurice set a new MEET RECORD and state best time of 7.49 in the 55m hurdles. Additionally he jumped 21' 5.5" to win the long jump and his jump from earlier in the season of 22' 1.5" ranks him fourth on the state honor roll. Another great performance was turned in by Micah P in the long jump as he jumped 20' 3.5" to finish in 5th place. The only other points on the day came from the 4x100m relay team of Jake A, Jason W, Jared B, and RaQuan C who finished in 8th place with a time of 46.09 improving their season best. Other PR performances on the day were turned in by sophomore Jason W (6.80) & junior Jared B (6.86) in the 55m dash, senior Micah P (8.38) in the 55m hurdles, senior Jake R (4:48.63) in the 1600m run, and sophomore Zach H (2:11.73) in the 800m run. The boys team looks forward to improving with tough workouts in the coming weeks, enjoying some warmer weather at the track, and opening the outdoor season at Lussier Stadium against Madison East. Have clothes to practice outside every day regardless of weather!!! Bring warm ups & extra clothes to meets to keep your muscles ready to compete!! !